Ken #649: "The Earth's temperature in AD1750 which according to you and the AGW community is 0.8 degC COOLER than today's temperature." The 0.8 C figure is warming since the global temperature record began in 1880 AD. Most paleoclimate reconstructions have 1750 being somewhat cooler than that. That said, in 1750 TSI was around 1365.5 w/m^2. In order for TSI alone to cause a 0.8 C increase in global temperatures it would have to increase to about 1370 (a level never seen in the planet's entire history) rather than it's current level of about 1365. I pulled all of this TSI information from the 'Advanced' version of this article. Hadn't you read it? "1750 has perhaps the best (not perfect) chance of being at equilibrium of those three dates - 900 temps have a steady downward trend, part of the Little Ice Age, I suspect, while 1880 is in early industrialization with numerous forcing changes from early CO2. But as the various forcings move around, the climate can only follow, only hitting equilibrium if (a) forcings don't change for a period long enough for the oceans to catch up, or (b) forcings reverse and pass climate change going the other way." Well I agree with you that AD1750 at near the Maunder Minimum would be closest to equilibrium so the temperature 'trajectory' is close to zero. Having said that - you seem to then confuse Temperature trajectories with forcings. I notice that none of ya'll (Ned KR, kdkd) seem to accept my basic point that the area under ALL the forcing curves represents the total energy gained or lost by the Earth system. Now this is interesting because if you take the areas under the "Sum of 10 Forcings" composite curve - you can see that from 1850 to about 1915 all the area under the curve is negative. According to this The Earth system has lost energy from 1850 to 1915 so we should see cooling. There is no significant cooling in temperatures in this period - in fact all charts show increasing temperatures since 1850. Clearly the only forcing which could maintain temperatures and add energy to offset the negative area was Solar, but this has been 'chart zeroed' at 1850 and has negligible area under its curve. If a S-B IR cooling response curve was added which corresponded to a temp rise of about 0.1 degC (probably more)in that period then another -0.4W/sq.m of IR cooling would add to the negative area under the combined curves. The only conclusion is that Solar should not have been zeroed, but entered the chart in AD1850 at about 0.2W/sq.m+, in order to maintain a positive area under the composite curves to support a 0.1 degC+ warming in that period. The same argument follows on for the rest of the chart up to date. @Ken, why are you looking for absolute values in graphs that show relative changes? @Ken - I completely agree with archiesteel, he's stated it perfectly. You are taking graphs showing deltas (changes) from a baseline, and claiming that absolute values you derive from them (which are not present in just those graphs) are inaccurate. This is quite simply an incorrect use of the data on your part, completely without basis. Your insistence on continuing to do this over 50-60 posts on this thread indicates to me that you need to step back, and reconsider your approach. @Ken: ""In fact, there is a continuous range of TSI values, any one of which can be balanced by a corresponding OLR value, leading to some particular stable temperature." Question: And can you guess what that particular temperature of interest is? " There is no such fixed temperature, it's a relative value. This theoretical equilibrium temperature would be determined by the sum of all forcings. Again, you're looking for an absolute reference point that doesn't exist. The study finds that during the most recent lull in the sun's weather cycle, the amount of energy that reached Earth increased, instead of decreasing as predicted. The planet may have experienced a slight warming effect as well, researchers said. pbjamm - Nope, it appears (as commented upon here by CBD and here by muoncounter, that "the possible range of variation here is more than an order of magnitude less than GHG forcings." Oh, I guess someone could make the argument - but they would be demonstrably wrong at the start. I heard about this news from a skeptic I know on IRC. Skeptic is being generous since he believes AGW to be a cult/conspiracy and has more than once referred to me as a "useful idiot" for not agreeing. Demonstrably false will not matter. Expect to see reference to this on all the usual sites. pbjamm at 05:44 AM, this may have some relevance. The chart below came from a link another poster provided in another thread and relates to changing rice yields under warming conditions. Does anyone want to comment on the significant upward trend as indicated in the bottom graphs which track radiation measured at the different trial sites and put it into perspective. Response: Just to be clear, let's not talk about rice yields on this thread. Worth noting, the solarimeter used to measure radiation as shown in John's graph is located at the bottom of the atmosphere, an important detail. I have been exploring a bit but could use some help. I'm looking for accurate temperature trends from 1800-1900. Also, earthquake frequency data during the same period including volcanic eruptions. I want to find if there is any changes in the data of significance post-1849. Found this via New Scientist and has been commented on fully at Real Climate. @Ken: "I notice that none of ya'll (Ned KR, kdkd) seem to accept my basic point that the area under ALL the forcing curves represents the total energy gained or lost by the Earth system." That's because the graph shows values starting from a relative reference point, and not an absolute level. You've been told this many times, and yet you refuse to hear it. This suggests you are not interested in debating, but instead pushing your point of view without addressing any challenges to it. My browser was showing nothing after page 13 - so I tried again. No, I hear what you say architeel - and it is wrong. There were none or negligible AG forcings BY DEFINITION in AD1750 because CO2 levels were steady at about 280ppmv and sulphate aersols, methane etc were not changed by large human release fossil fuel burning. This would be not much different in AD1850. So in fact for the AG forcings - the RELATIVE value IS the ABSOLUTE value because none supposedly existed in AD1750. Get it - anthropogenic forcing is supposed to be a human fossil fuel burning effect. So if you then use these AG forcings to illustrate the portions of warming contributed by each - you need to compare them with the ABSOLUTE value of Solar forcing to effectively compare apples with apples. Yeah I had read the advanced version. Where did you get the TSI in AD1750 at 1365.5? The charts show it at or below 1365W/sq.m. Dr Trenberth calculates his climate response due to IR cooling at -2.8W/sq.m based on a surface warming of 0.75degC (close enough to 0.8). He equates this surface warming increase to the increase in the radiative equilibrium temperature of the planet. This figure is then used to subtract from the AG forcings from IPCC AR4 Fig2.4 which we know are referenced to AD1750. I have made the rash assmption that the surface warmng since AD1750 is 0.75degC (0.8degC for short), otherwise Dr Trenberth would not be adding or subtracting apples from apples, would he? @Ken: "No, I hear what you say architeel - and it is wrong." You may hear what I say, but you clearly don't understand it. "So in fact for the AG forcings - the RELATIVE value IS the ABSOLUTE value because none supposedly existed in AD1750." The graph (assuming we're still talking about KR's graph at #623) doesn't show "AG forcings", it shows "well-mixed greenhouse gases" forcing. "This starts from a baseline of 1880 (where the "zero" is set), showing deltas (changes) from those values." What's the use of stating all kinds of numbers if you don't get simple logic? The KR chart at #623 uses the same data as IPCC AR4 Fig 2.4 forcings which are labelled 'Anthropogenic' (AG my shorthand). Natural Forcing from Fig 2.4 is Solar irradiance. 'Well mixed greenhouse gases' forcing is a sum of CO2, CH4, N2O and Halocarbons - which are termed 'long lived greenhouse gasas' in same Figure. At 2005 CO2 contributed about 1.66W/sq.m and CH4 and the others about 1.0W/sq.m - total about 2.7W/sq.m - which aligns with the green curve in Chart #623. All these AG forcings are supposedly caused by fossil fuel burning and and did not exist before AD1750 - and were pretty small before AD1850. So 'well mixed greenhouse gase forcing' archisteel is in fact the main positive AG forcing - same thing. Maybe a short course in IPCC AR4 would help your understanding. @Ken: don't be so arrogant when you keep missing the same point over and over again. In fact, by saying that "well-mixed greenhouse gases" is the same as "positive AGW forcing," you confirm the point I was making - and admit it's false to claim that it was a zero in 1750, because there *were* greenhouse gases in the atmosphere back then. Again, the reason these start in the middle of the graph is that the graph measures deltas, not absolute values. Ken Lambert - You incorrectly state that I "confuse Temperature trajectories with forcings". What I said was that non-zero temperature trajectories indicated non-equilibrium climate states (energy imbalance, to be more clear), and zero or non-zero, the state and trajectory of the climate include the effects of forcings at that time. Forcings are never zero (unless looking at some hypothetical object at 0°K). But when looking at how the climate has changed the we can compare changes in forcings (deltas). 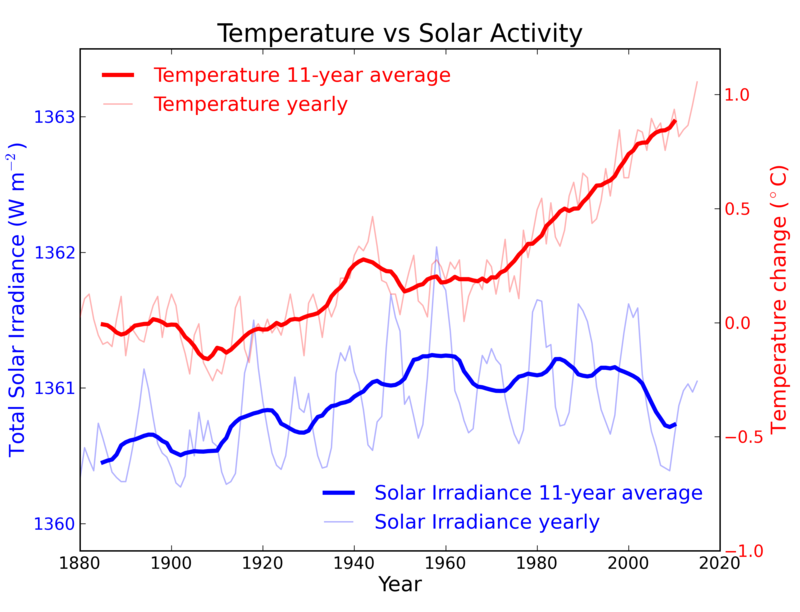 You have also yet to address the fact (shown in the data you've presented, as well as in mine) that changes (note: changes) in radiative forcings due to greenhouse gases since the beginning of the industrial era are an order of magnitude greater than changes of insolation. And that they correlate quite well with the heating since the 1970's. You have presented exactly zero evidence for any mis-measure of TSI at any point in this discussion, and hence have no support for your apparent theory of TSI causing global warming. Again - it's not the sun. "In fact, by saying that "well-mixed greenhouse gases" is the same as "positive AGW forcing," you confirm the point I was making - and admit it's false to claim that it was a zero in 1750, because there *were* greenhouse gases in the atmosphere back then"
Of course there were 'well mixed greenhouse gases' in the atmosphere back in AD1750. I never claimed otherwise. What you don't get is those WMGG were not in theory 'forcing' (warming or cooling) the planet. The 'forcing' equation for the main GHG - CO2 is quoted as 5.35ln(CO2a/CO2b)where CO2a is the (well mixed)concentration of CO2 in the atmosphere at any time and CO2b is 280ppmv - the pre-industrial concentration. You can see that that if CO2a = CO2b = 280ppmv there is no theoretical forcing from CO2. "You have presented exactly zero evidence for any mis-measure of TSI at any point in this discussion, and hence have no support for your apparent theory of TSI causing global warming." It is well established that Solar forcing in the range of 0.2 - 0.5W/sq.m was responsible for a a substantial portion of warming at least in the first half of the 20th century when theoretical CO2GHG forcing was much lower - by the equation I quoted in #672 above. Again the absolute values need to be used above a theoretical 'zero' equilibrium to quantify the energy gain or loss from each forcing. If you want a mis-measure of the current TSI - go to the SORCE website for the latest TIMS measurements - only out by a lazy -4.5W/sq.m. Ken Lambert - Are you certain of your numbers, 4.5W/m^2? Because looking at the graphed data (sorry, can't get to the original behind the paywall), the difference is on the order of 4-5 mW/m^2, not W/m^2! That's 0.0045W/m^2, just to make it clear. Again, that's several orders of magnitude too small to be the major issue with late 20th century warming. I could be mistaken - I don't have access to the original paper - but the effect appears to be very small. If I'm incorrect, please provide a link to the portion of the SORCE website (I spent some time, couldn't find it) that indicates such a major measurement error. It certainly doesn't appear to be visible in Haigh et al 2010. @Ken: "What you don't get is those WMGG were not in theory 'forcing' (warming or cooling) the planet." Of course they were warming the planet, otherwise it would be much colder. The fact that it was relatively stable doesn't mean it had no effect, and in fact temperatures were far from stable pre-1750 (LIA, MWP, etc.) - they simply didn't go as high as the current trend is reaching. Furthermore, concentration wasn't stable at 280ppm, but varied between 180 and 280ppm. Again, the point is moot, as the graph does not show absolute values, but deltas. The fact you continue to claim otherwise shows that, despite using all the trappings of scientific discourse, you struggle to understand some vary basic concepts about the science. "Again the absolute values need to be used above a theoretical 'zero' equilibrium to quantify the energy gain or loss from each forcing." You appear to have the concept of a 'baseline' confused - it is not the same thing as a 'theoretical zero equilibrium' whatever that means. This is perhaps the root of the problems you are having with your illogical and confused argument. Here is the link - have a look for yourself. Seems that the Monitoring community has been stumped over this -4.5W/sq.m discrepancy since 2005. Pray please explain your interpretation of the phrase "There remains an unresolved 4.5 W/m^2 difference between the TIM and other space-borne radiometers, and this difference is being studied by the TSI and radiometry communities" from the link that you provided. Personally I feel more comfortable with the empirical surface data, which shows pretty clear anthropogenic warming from multiple angles. If you can explain the TIM/TSI issue in layman's terms (i.e. no jargon) without attempting to overlay your own preconceptions/interpretations on what's happening, that would be useful and valuable. The value will decrease if you use it to promulgate your sceptical agenda though - save that for a different post. When was it last at 180ppmv archisteel? Looks pretty close to 280ppmv for the last 1000 years or so. Happy to argue on a baseline which gives no warming or cooling of the Earth for any forcing. Warming and cooling in pre-industrial times was caused by Solar variation - output and orbital exposure of the Earth to the sun. CO2 lagged Solar warming as a feedback mechanism on interglacial time scales. Of course at some point warming was arrested by IR radiative cooling and a cooling phase followed. "The value will decrease if you use it to promulgate your sceptical agenda though - save that for a different post." Is that a banned political comment kdkd? May I only play in this sandpit with you as gatekeeper of pure AGW thought? Regarding TIMS - this illustrates the point that BP has made many times - satellites have high precision but low accuracy. Good for day to day or month on month variation but not for absolute values. The earlier satellites were reading TSI at around 1366W/sq.m - TIMS is 1361.5W/sq.m. Which is right? Now notice how no-one is trying to splice TIMS to the earlier satellites because the TSI would have a huge offset correction yet SLR satellites are being spliced eg TOPEX-Jason with a claimed zero offset due to extensive intercalibration. The TIMS people also produced an energy balance based on 1361.5W/sq.m which Dr Trenberth said was wrong in spades. It does seem strange that while up to date TSI charts are on the SORCE website - the comment on the minus 4.5W/sq.m discrepancy has not been updated since 2005. 5 years seems a long time for the "difference being studied by the TSI and radiometry communities" without some resolution. "The results of TSI monitoring experiments are reported on their 'native scales' as defined in SI by the ‘self-calibration’ features of their sensor technologies. Systematic uncertainties in the metrology used to relate their observations to SI caused the ± 0.25 % spread of results during the first decade of monitoring. The tighter clustering of results after 1990 is attributable to dissemination of more accurate sensor metrology among the various experiments and national standards labs. The causes of the ~ -0.35 % difference between the ACRIM3 and VIRGO results and the SORCE/TIM results are not presently understood in this context." It does appear that different satellites measuring TSI have inter-platform calibration issues, Ken - you are correct in that. I would encourage you to look at that site, though, and consider the work done on composite TSI time series, where this is addressed to some degree. So perhaps an absolute TSI number is not as fixed as we would like. A major question here, though: Do the absolute value of TSI, IR radiation, etc., matter? Or can we determine what's having an effect by looking at well established changes of these values? We know the history of TSI changes pretty well over the last 800,000 years, between satellite measurements, sunspot observations, isotopic analysis of ice cores, etc. - the correlation of these measures to absolute values isn't as good as we would like, but the ability to track changes is excellent. The situation is rather a lot like tracking the carbon cycle. We have a rough idea of total carbon sources (natural and manmade), we have a rough idea of carbon sinks (ocean/vegetation/weathering), but we have a really really accurate measure of how atmospheric CO2 changes, and how that relates to man-made CO2. Thus we can state that man-made CO2 is contributing ~2ppm/year to atmospheric CO2. We know how it's changing. So, while we may not know absolute TSI as accurately as we like, we know how it has changed, and it's clear that it has not changed in a manner sufficient to account for late 20th century warming. We know accurately how the inputs to the climate system have changed over quite a long period. We also know accurately how the outputs (temperature) have changed as well. Even the simplest black-box model of climate will then tell us which stick has poked the box inducing those correlating changes. Your "absolute value" issues are really not valid.
" The de-facto redundant, overlap TSI monitoring approach that has provided a contiguous record since 1978 resulted from the deployment of multiple, overlapping TSI satellite experiments. The traceability of this database is at the mutual precision level of overlapping experiments. ... A carefully implemented redundant, overlap strategy should therefore be capable of producing a centennial TSI record with traceability of ~ 500 ppm, providing a useful signal to noise ratio for assessing climate response to TSI variation. • A redundant, overlapping TSI measurement strategy using existing ‘ambient temperature’ instrumentation can provide the long term traceability required by a TSI database for climate change on centennial time scales." They seem very confident in their ability to establish accurate TSI information. And even more confident in their ability to measure changes in TSI. @Ken: "Looks pretty close to 280ppmv for the last 1000 years or so." I'm sorry, were we only talking about the last 1000 years? I must have missed that in your latest attempt at obfuscation. The point is that climate is not static, and there is no ideal reference point. @Ken: Also, aerosols and land use also had an impact. The forest that once covered much of Europe was more than half gone by 1750. This likely had an impact, even if it was relatively small. I still fail to see what the point is of this entire discussion. Limitations for accuracy of absolute measurements across different measurement systems and or devices is pretty much universal, although we do an OK job with things like thermometers in the lab these days. Anyway, it's a problem that limits our ability to make conclusions, it's not evidence showing falsification. "The TIMS people also produced an energy balance based on 1361.5W/sq.m which Dr Trenberth said was wrong in spades." Could you explain this in a little more detail please. Oh - you mean THAT chart KL....the one for the last 1000 years. I find no problem with the concept of looking at each forcing component separately in order to ascertain the importance of each. We know that they all act in concert at any point in time. I am perfectly happy with GISS Fig. 613 reproduced from #631 in the absence of something better. Where the Solar irradiance forcing crosses the axis is where TSI is neither warming or cooling the planet, in the absence of other forcings. Any disagreement with that? This is what KR said at #650: "Ken Lambert - I would agree, there is one TSI for one equilibrium temperature of the Earth, with all other variables held constant"
You have my permission to leave now archisteel if that is your desire. Ken Lambert - "Where the Solar irradiance forcing crosses the axis is where TSI is neither warming or cooling the planet, in the absence of other forcings. Any disagreement with that?" In short, Ken, I absolutely disagree with that. You seem to have missed what I (and others) have said in many ways, on many posts. In particular, "with all other variables held constant". Is the temperature the same as the baseline starting point? Was the temperature trajectory at the start of this baseline period zero, with sufficient time at zero for time constants of ocean heating and secondary feedbacks to stabilize? (No on the last two points, incidentally.) Let alone the question on the other forcings, which have not held completely constant over this period. This is not a single variable system! Ken, do you understand that the GHG forcing changes over the last 150 years are an order of magnitude greater than the TSI changes over that period? Please answer that question. "with all other variables held constant"
This is something you get for free in multiple regression models - you can examine the predictive ability of individual variables by holding all other variable constant - that 's what the various R2 values and other diagnostics give you. Ken didn't seem to get this when I went through this with him many aeons ago (using temperature anomaly as the predictor variable rather than TSI, but same diff ...). So what do you find wrong with the baselines in GISS Fig 613 from Post #631 KR? I thought we agreed that circa AD 1700 - 1750 was a 'low temperature trajectory' - a Maunder Minimum in fact. Anyway kdkd seems to have no problem with 'holding all other variables constant' in order to ascertain the contribution of each. If one variable did depend on another in an identifiable relationship (lets say CO2 positive forcing is directly related to cloud cooling negative forcing) then the two variables could be treated as one with a known equation for the combined forcing. Go look at the CO2 forcing via the IPCC equation and tell me what the relative forcings are with Solar in say 1800, 1850, 1900, 1950 and 2005. In 2005 you can find Solar at about 0.3 - 0.4W/sq.m and CO2 at 1.66W/sq.m - hardly an order of magniude difference and only at the most recent end of the time scale. You are actually looking sensible among some of this lot kdkd. I'm interstate for a few days - will catch up with you Monday. Maybe time to re-visit the karaoke and look for that CO2 saturation again. @Ken: why would I leave? I enjoy seeing you squirm around while trying to defend illogical points. Your arrogance only compounds the farcical nature of your arguments. "Where the Solar irradiance forcing crosses the axis is where TSI is neither warming or cooling the planet, in the absence of other forcings. Any disagreement with that?" TSI is warming the planet. How could radiated energy cause the planet to cool? Again, you're confusing absolute values with deltas. You have failed to successfully argue your point. You can stick around if you want, but you'll only make yourself look more foolish. Your choice. The greenhouse gas forcing is only 4-5 times the TSI forcing, and the TSI change is currently going in the opposition direction from the temperatures. Not an order of magnitude - I was off by a factor of two. But it's still 4-5x the TSI forcings! It's really, really not the sun. TSI changes have not correlated with temperature changes over the last 40 years, GHG forcing changes have. Unless you somehow disagree with this basic and quite provable point? F.CO2 = 5.35ln(CO2*conc/280) W/sq.m where CO2*conc is the well mixed global concentration in ppmv at any point in time. F.Solar in W/sq.m is from IPCC 2007 Fig 613. Until circa AD1950 the F.CO2 did not overtake the F.Solar and in AD2000 it was 3x and only in AD2005 had it reached 4x. Again it is the area under the curve which represents the total available energy from both sources and both add together as I have calculated elsewhere back to AD1750. S-B radiative cooling has grown to -2.8 W/sq.m to date as a climate response to 0.75 degC warming. "TSI is warming the planet. How could radiated energy cause the planet to cool?" Its called IR cooling from S-B equation proportional to T^4. In 2005 at about minus 2.8W/sq.m. due to a 0.75degC warming since AD1750. IR radiating temp is currently about 255degK. Which was 254.25 degK in AD1750. where 240W/sq.m is the original IR outgoing from the planet. Hence IR outgoing increases proportionally with (T2/T1)^4. I'm sorry, Ken, can you explain this to me in layman's terms? This site does a great job at explaining concepts in everyday language, you should follow that example. The multiple regression on the climate karaoke confirms your analysis rather nicely - after the mid-20th century, co2 is the main driver of warming (as expressed in that case by temperature anomaly as the dependent variable). I can't remember offhand what the precision of the prediction is, but it was reasonable, although regression assumptions were violated somewhat. Who'd have thought - convergent evidence. I can't see this supporting your 'sceptic' argument at all though. It more confirms the opposite. If you want to know the answer to sun spot production and the link to global temperature variation, then see this site, the answer will surprise you!! I wouldn't waste your time with Howard's site. There seems no end to the assemblage of clever tricks and blockades which the bretheren of the alarmist church can dream up. And since they hold pretty much all the top jobs all over their global diocese they for the most part go undetected and unreported." As the planet warms from a forcing imbalance, it emits black body radiation in proportion to the fourth power of the absolute temperature (degK) via the Stefan-Boltzman equation. The forcing imbalance gap then closes and a new equilibrium temperature is approached. The 'emitting temperature' is quoted as about 255degK which is the temperature that space sees the Earth. The average surface temperature is about 15 degC or 288degK. The difference of 33degK is the 'greenhouse effect' of the atmosphere which slows down the heat transfer like an insulating blanket. Firstly - KR seems to still not get the fact that a forcing component does not have to be rising to be adding energy to the system. A steady or roughly constant forcing such as F.Solar (say S) will add energy over time as St - a linear increase. Lets say that F.CO2 is linearly rising wrt time (over a short period of say 25 years). Therefore F.CO2 = Kt where K is a constant. F.CO2 will add energy over time as Kt^2/2 - a squared function increase. Secondly, the F.CO2 and other component forcings are theoretical and not directly measured - only the combined imbalance is directly measured at TOA. This is supposed to be +0.9W/sq.m. In fact the CERES satellites are measuring +6.4W/sq.m. So this is 'corrected' down by -5.5W/sq.m to the theoretical imbalance. The problem is that not even the 0.9 is being observed in OHC. The wide error bars on aerosol cooling, and other forcing components mean that the mix of components is not really known accurately. I would like to see a combined forcing chart including S-B cooling over time to see what the energy balance is as well. Anyway - I think my point is made - the Solar forcing component 1950 - now is about 0.4W/sq.m - not 0.12W/sq.m as the IPCC chart implies.